Talk about stacking the deck. Doesn't it seem a bit fishy when people are bussed in, given yellow shirts and told to sit there and shut up throughout the meeting? How much were these people paid to be at the meeting and do they even have a clue what the issue was about? I think it is quite strange when Mercy and The Related Group have to go to such strong tactics to bully the Grove citizens. Sickening. 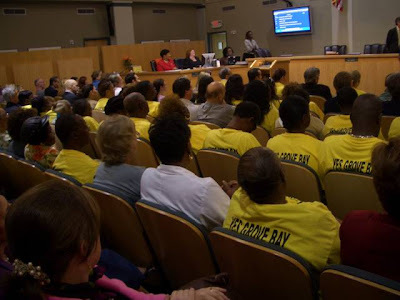 I don't think the yellow shirts persuaded the Commission, their minds were set. But it just shows what horrible neighbors and horrible people Mercy and The Related Group are. They don't care who they hurt as long as they make their money. Thank you Harry Emilio Gottlieb for the photos. "As long as they make their money." Who? Mercy and The Related Group or the crooked members of the City Commission? I heard Related paid $100 to get people to show up. Supposedly none of the yellow shirted money takers lived in the Grove. Typical. Everyone who spoke for the sleazy project was getting paid. It was all about money. 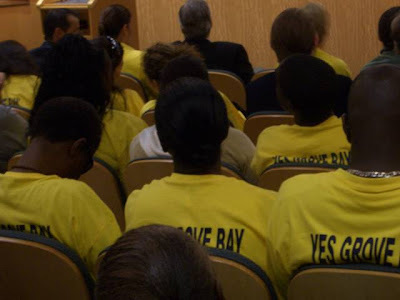 Once the hearing was over the yellow shirts were taken off and dumped in the trash, where the project belongs. Now we should send letters (emails) to all the Commissioners - both rebuking those who aided and abbetted the Related Group and their cohorts; and thanking our two stand-up Commissioners for their commitment to our collective voices. Please cc us all (esp this blog). For while we didn't have yellow T-shirts to charade, we do have the power of the pen to crack the brittle shell of hypocrisy shielding their lack of conscience. Does anyone have the email address for Matsuko (or whatever the name of the Mercy honcho whose bright idea this is)? Keep it honest, and forthright. Let's not ever sink to depths of slander and corruption. Funny, these people don't look like they can afford to buy into these luxury condos? Anything for a buck, eh. Sick. Isnt paying someone to attend a public hearing a form of lobbying? I doubt all those people went up and wrote their names on the list of people lobbying. I think we should sent this photo to the district attorney. There is some serious corruption going on. Just like the county housing agency, we have a serious corruption problem. I think its time we bring in the feds. Well, Tinaji, if you take slander away from this group of bloggers, what will they have left to say? Don't know why anyone is worried about who will buy these condos next to a hospital -- that is Related's problem. I will say that I am glad that Mercy is not expanding its medical campus -- that would be the kiss of death for traffic on Bayshore. There can't be that many people that will buy these luxury condos due to their cost. And I can't imagine they would be the types that go to work everyday like the rest of us -- at least they won't add to our traffic problems in Miami. is there any actual evidence that these people were paid anything, or is it all just a guess? I think it is wrong to keep changing the zoning laws. What good are the laws if they keep changing them when a developer with big bucks comes around? The pictures in the Herald today show pictures of Cervera realtors wearing the shirts. Of course they are for the project since they want to earn big commisions on the sales, starting at 3million that's a good paycheck. The only people for this project are the ones who are going to make money out of it. Let's preserve the little history we have in Miami. BTW, is there like a petition for people to sign and get names to show to the commisioners? Or will it be a waste of time since they might be getting some $$$ out of this? Yea, a voice of reason, Adam -- sounds to me as those most on this blog just want to throw stones without evidence -- why would you want to confuse anyone with fact? Several people wearing the yellow shirts admitted they were being paid $100 to show up and be visible. They also arrived very early so they could take seats away from Coconut Grove residents. We do not know if Cervera real estate agents were paid $100 to wear the T-shirts. Perhaps the opportunity to earn $250,000 per year in commissions was reward enough? And the big issue is the rezoning. Should not a change in zoning be a planning issue and not be based on who pays the most in "payments"? What happened to the goal of not harming neighborhoods? look at it this way, the money that Perez paid those west Grove citizens, made it unnecessary for them to break into a few homes and cars in the South Grove that day. And we all know Spence-Jones wants every opportunity for "her people", who she describes as "5 time felons" to make a living... Thankfully a few homes were spared Thursday morning. It's a pretty old and highly ineffectual tactic. When I lived at Atlantis on Brickell, Baumann and BAP did the same thing for the Skyline. Everyone can see through it and hopefully comissioners are not so stupid as to think that the entire thing is real. In one of the zoning meetings, a few of them even stood up and pleaded for the commissioners to approve the Skyline design as it was "or they would be unemployed, etc." sob sob. Tucker, our lawyer, just asked them to explain why design would make a difference on employment and they shut up. No one in his/her right mind falls for this ruse. "Everyone can see through it" -- funny -- you can actually see through Atlantis on Brickell. $100 to just SIT THERE?